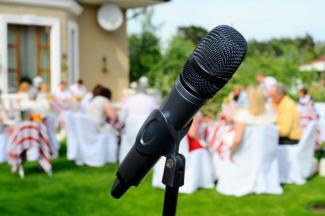 Groom wedding speech examples can help any groom give the perfect speech at the rehearsal dinner or wedding reception. A groom's speech or toast has no specific rules, being kind, open, and welcoming usually ensures success. Each groom's speech template can be customized to suit your wedding. Click on the image to print the groom's speech examples using your PDF program, like Adobe Reader, to download, print, and save them to your computer. Click to print the groom's speeches. Hello everyone, I would like to thank you all for coming here today to celebrate with us. It means the world to myself and __________________ (bride's name) that you chose to take time out of your busy schedules and acknowledge our nuptials. When I met ________________ (bride's name) on _________________ (date of first meeting), I felt __________________________________________ (describe how felt at time of meeting new wife). At the time we were both ____________________________ (describe place, situation or life events going on at the time), which meant ___________________________ (explain the impact of this event or situation). I had no idea then that she would become my wife, which I displayed by ____________________________________ (describe how the groom acted when he first met the bride). However, after _________ years (or months), I finally understood that, without ________________________ (bride's name), I was incomplete. I have never been happier than when she agreed to marry me or today, when she finally became my spouse. I cannot thank our parents enough for their support. I also cannot thank you all enough for demonstrating your support for our relationship by joining us here today. Thank you. Hi, there, everyone. When __________________ (bride's name) and I discussed my giving a speech, I never thought I'd be so nervous. The funny thing is that I'm more nervous now than ever, even when I was standing at the altar today. You see, I have never questioned my love for _________________ (bride's name) or our relationship. I know in my heart that she and I are made for each other and a perfect match because ________________________________________. Because of this, there is nothing I was more certain of in my entire life than marrying _______________ (bride's name). Although the wedding process can be stressful for some guys - as can be asking someone to marry them - I have always felt 100 percent secure in my decision. I am, however, still extremely glad that ________________ (bride's name) said yes and that she showed up today! ____________________ (bride's name), I love you, and cannot thank you enough for all you do for me and for being willing to become my wife. I think that everyone in this room can agree with the statement that you make me a better person. After all, it was you who got me to __________________________________ (insert something funny that the bride induced the groom to change or do). And obviously that was a huge success! Also, thank you to everyone here tonight and our families. Your support means the world to us. I hope you all will join me in raising your glass to my beautiful bride, our parents, and all of you for being here today. Well, I think you all know me, but in case you don't, I'm __________________ (insert groom's name), the groom in this wedding. I speak on behalf of myself and __________________ (bride's name) when I say "thank you" for being here tonight to celebrate us. Wow, to think that _______________________ (insert "in a short time" or "a short time ago", depending on when speech is delivered) ___________________ (bride's name) and I _______________________ (insert "will become" or "became") man and wife. We're officially a joint entity! _________________ (bride's name,), isn't it romantic to think of ourselves as a legal, joint entity? Although some people may say "no", I find our newfound partnership extremely romantic. But seriously, though, thank you for marrying me. Without you I would be lost and definitely less loved. And now, I introduce ____________________ (next speaker), ______________________________ (insert relationship of speaker to wedding party or couple), who would like to say a few words. There are no specific requirements for a groom's speech but there are some groom's speech tips to follow that will ensure you cover everything. Regardless of content, however, the speech should reflect the couple's style, such as lighthearted or serious, and the mood of the event, meaning informal or formal. Giving an informal speech during a formal wedding reception could make the speech seem out of place or guests uncomfortable. Including several or all of these elements allows a groom to give a thorough, uplifting, and romantic speech. While giving the speech, the groom should speak slowly and elucidate so that all guests can hear and understand him. The groom can give the speech at the couple's table, on the stage set up for the band, or on the dance floor - wherever he feels most comfortable. Note, however, that giving a speech at a table is considered informal. It is perfectly acceptable for the groom to bring a copy of the speech or notes with him during the speech. However, the groom should not just read directly from those notes, but rather use them as guidance. He should practice the speech a few times prior to ensure that he knows its general outline, flow, and contents. Also, if he plans on closing with a wedding toast, he should remember to bring his glass up to the microphone. This will avoid a delay in the speech while he retrieves his glass and allows him to close appropriately and on time. Customize your speech to your wedding's mood and for your bride so that it reflects you two and your event. Remember, practice makes perfect!